The c-Jun N-terminal kinase (JNK) pathway is one of the major signaling cassettes of the mitogen-activated protein kinase (MAPK) signaling pathway. It functions in the control of a number of cellular processes, including proliferation, embryonic development and apoptosis. The pathway takes its name from the c-Jun N-terminal kinases 1–3 (JNK1–JNK3), which are the MAPKs that interact with the final effectors. The JNK pathway is activated by a bewildering number of mechanisms. This complexity is evident by the fact that there are 13 MAPK kinase kinases (MAPKKKs) responsible for feeding information into the JNK pathway. The JNK pathway can also be activated through G protein-coupled receptors (GPCRs) using G proteins such as G12/13. • The JNK pathway has been implicated in the mitogen activated protein kinase (MAPK) signaling in cardiac hypertrophy. The c-Jun N-terminal kinases (JNKs) were first described in the early 1990s. Landmark discoveries in the area of JNK research are summarized in Figure 1. The JNK module plays an important role in apoptosis, inflammation, cytokine production, and metabolism. The JNK module is activated by environmental stresses (ionizing radiation, heat, oxidative stress, and DNA damage) and inflammatory cytokines, as well as growth factors, and signaling to the JNK module often involves the Rho family GTPases Cdc42 and Rac. Those receptors or receptor-independent stress-induced membranal changes further transmit the signals to adaptor proteins that can by themselves activate kinases in the MAP4K, and sometime, MAP3K tiers of the JNK cascade. Next, the activated MAP3Ks transmit the signals to kinases at the MAPKK level, which are mainly MKK4 and MKK7. As the other MAPKKs, the main JNK kinases (MKK4, MKK7) are activated by phosphorylation of the typical Ser-Xaa-Ala-Xaa-Ser/Thr motif (Ser 198, Thr 202 in MKK7) and are then able to transmit the signal further to the JNK level. Shortly after activation, like the other MAPKs, JNKs translocate into the nucleus where they usually physically associate with their targets- transcription factors such as c-Jun, ATF, Elk1 and activate them. The mitogen-activated protein kinase kinase 4 (MKK4) was first identified in a cDNA library from Xenopus laevis embryos by a PCR based screen and called XMEK2. The mkk4 gene is located on human chromosome 17, encodes a protein of 399 amino acids and shares 94% homology with the mouse and rat protein. MKK4 is involved in a variety of physiological and pathophysiological processes. The mitogen-activated protein kinase kinase 7 (MKK7), also called stress-activated protein kinase/extracellular signal regulated protein kinase kinase 2 (SEK2) or c-Jun N-terminal kinase kinase 2 (JNKK2) was first cloned from cDNA of murine testis tissue. The loss of mkk7 leads to decreased proliferation. The c-Jun N-terminal kinases (JNKs), also called stress-activated protein kinases (SAPKs), have first been discovered in a c-Jun binding assay with extracts from UV-stimulated HeLa cells. JNKs are activated by concomitant phosphorylation of a threonine and a tyrosine residue within a conserved T-P-Y motif in the activation loop of the kinase domain by MKK4 and MKK7. The jnk1 and jnk2 are widely expressed, whereas expression of jnk3 is mainly confined to brain, heart and testis. JNK pathway is generally a “death” signaling pathway. It control the cell response to the harmful extracellular stimulus such as inflammatory cytokines, UV-irradiation gamma-irradiation etc.. Cells under these harmful stimulus may have DNA mutation or damage. If the DNA damage could not be repaired immediately, the cell must be programed to death (also called apoptosis) to avoid these bad mutation or damage. JNK signaling pathway is such a death pathway that control cell death. 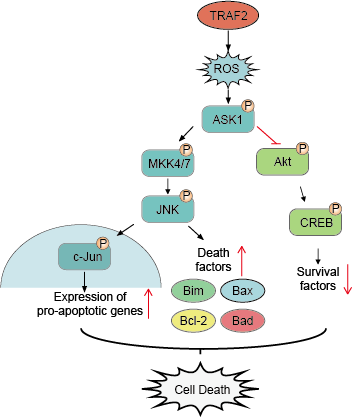 There are two main downstream signaling of JNK pathway: one is activation of death signaling such c-Jun, Fos and apoptosis signaling such as BIM, BAD, BAX protein or active P53 transcription, to promote cell apoptosis; the other is inhibition of the cell survival signaling such as STATs and CREB (Figure 2). Figure 2. Downstream signaling of JNK pathway. JNK can promote apoptosis by two distinct mechanisms. In the first mechanism targeted at the nuclear events, activated JNK translocates to the nucleus and transactivates c-Jun and other target transcription factors (TF). JNK can promote apoptosis by increasing the expression of pro-apoptotic genes through the transactivation of c-Jun/AP1-dependent or p53/73 protein-dependent mechanisms. In pathways directed at mitochondrial apoptotic proteins, activated JNK translocates to mitochondria. There, JNK can phosphorylate the BH3-only family of Bcl2 proteins to antagonize the anti-apoptotic activity of Bcl2 or Bcl-XL. In addition, JNK can stimulate the release of cytochrome c (Cyt C) from the mitochondrial inner membrane through a Bid-Bax-dependent mechanism, promoting the formation of apoptosomes consisting of cytochrome c, caspase-9 (Casp 9) and Apaf-1. This complex initiates the activation of caspase-9-dependent caspase cascade. In another mechanism, JNK can promote the release of Smac/Diablo (Smac) that can inhibit the TRAF2/IAP1 inhibitory complex, thereby relieving the inhibition on caspase-8 to initiate caspase activation. In addition, by phosphorylating BAD and its sequestering partner 14-3-3, JNK can promote BAD-mediated neutralization of the Bcl2 family of anti-apoptotic proteins. Finally, JNK can phosphorylate Bcl2 for suppressing its anti-apoptotic activity. Just like the other MAP kinase signaling pathway, JNK pathway could also be regulated by the scaffold proteins. Five structurally distinct scaffold proteins have been shown to assemble the JNK signaling unit. These proteins contain a variety of protein-interacting motifs and constitute a family normally referred to as JIPs. Scaffold proteins can tethering individual pathway components together, so that different pathways can be insulated from one another. This becomes particularly useful when single components are used alternatively in different pathways. Scaffold proteins can also establish connections between pathways and help to distribute signals. More recent modelling data suggest that depending on cellular conditions, spatial organization of kinases on scaffold proteins can either enhance or inhibit signal propagation through a kinase cascade. To date, the reported JNK phosphatases are the dual-specificity MKPs. MKP-7 and VH5 are JNK phosphatases that also dephosphorylate p38a and b. Other MKPs with some reported activity toward JNKs are DSP2, MKP6, MKP1, MKP2, MKP4 and MKP5. Though little is known about the phosphatases that act on upstream MAP2Ks and MAP3Ks, the phosphoserine/threonine protein phosphatase 5 (PP5) was reported to suppress hypoxia-induced ASK1/MEK4/JNK signaling. JNK is implicated in oncogenic transformation; A role for the JNK pathway in tumorigenesis is supported by the high levels of JNK activity found in several cancer cell lines. The most insightful evidence for a role of JNK/SAPK signaling modules in cancer has come from the identification of MKK4 as a putative tumor suppressor. MKK4 is a MKK capable of phosphorylating both JNKs and p38 MAPKs. This distinguishes MKK4 from MKK7 which has only been shown to phosphorylate JNKs and not p38 MAPKs. Genetic inactivation of the MKK4 gene on chromosome 17 p has been reported for several different tumor types including a subset of breast, biliary and pancreatic carcinomas. JNK3 activation is a pro-apoptotic pathway in hippocampal neurons. Consistent with a role for JNK3 in excitotoxic neuronal cell death. The role of JNK3 in excitotoxicity suggested that JNK/ SAPK pathways would be involved in other neuronal death responses and neurodegenerative diseases. A clear role of JNK/ SAPKs in ischemia-induced cell death has been demonstrated in mice. JNK3 may also prove to be a therapeutic target for neurodegenerative diseases including Parkinson's and Alzheimer's disease. JNK/SAPKs are clearly involved in ischemia-induced cell death and reperfusion injury in several different tissues and the control of insulin sensitivity in metabolic regulation. There are many other suggestions in the literature that link JNK/SAPK signaling to additional human diseases such as type I diabetes, osteosarcoma, ataxia and immune system dysfunction. JNKs probably play a role in chronic inflammation, airway hyper responsiveness and protease-directed tissue remodeling. It is likely that selective JNK1, JNK2 and JNK3 inhibitors will be needed for specificity and lack of toxicity. It may also be useful to develop specific MKKK inhibitors to selectively block JNK activation in response to different upstream inputs. 1. Keshet Y, Seger R. The MAP kinase signaling cascades: a system of hundreds of components regulates a diverse array of physiological functions[J]. MAP Kinase Signaling Protocols: Second Edition, 2010: 3-38. 2. Bogoyevitch M A, Ngoei K R W, Zhao T T, et al. c-Jun N-terminal kinase (JNK) signaling: recent advances and challenges[J]. Biochimica et Biophysica Acta (BBA)-Proteins and Proteomics, 2010, 1804(3): 463-475. 3. Engström W, Ward A, Moorwood K. The role of scaffold proteins in JNK signalling[J]. Cell proliferation, 2010, 43(1): 56-66. 4. Dhanasekaran D N, Reddy E P. JNK signaling in apoptosis[J]. Oncogene, 2008, 27(48): 6245-6251. 5. Weston C R, Davis R J. The JNK signal transduction pathway[J]. Current opinion in cell biology, 2007, 19(2): 142-149. 6. Jing L I U, Anning L. Role of JNK activation in apoptosis: a double-edged sword[J]. Cell research, 2005, 15(1): 36-42. 7. Nishina H, Wada T, Katada T. Physiological roles of SAPK/JNK signaling pathway[J]. Journal of biochemistry, 2004, 136(2): 123-126. 8. Johnson G L, Nakamura K. The c-jun kinase/stress-activated pathway: regulation, function and role in human disease[J]. Biochimica et Biophysica Acta (BBA)-Molecular Cell Research, 2007, 1773(8): 1341-1348.